04-Apr-2019 Genting Singapore - Resorts World, Transform! 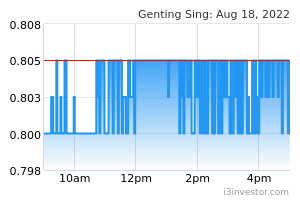 23-Mar-2019 Is Genting Singapore Ltd (G13.SI) Worth A Buy At This Point? 21-Feb-2019 Genting Singapore - 4Q18 Results Review ~ Game On! Genting Singapore PLC, together with its subsidiaries, engages in the development, management, and operation of integrated destination resorts. The company’s integrated destination resorts comprise gaming, hospitality, leisure, and entertainment facilities, as well as meeting, incentive, convention, and exhibition (MICE) venues. The company primarily owns Resorts World Sentosa, a destination resort, which offers a casino, Universal Studios Singapore Theme Park, Adventure Cove Waterpark, S.E.A. Aquarium, MICE facilities, hotels, Michelin starred restaurants, and specialty retail outlets. It is also involved in the gaming and integrated resort development activities in Australia, the Bahamas, Malaysia, the Philippines, the United Kingdom, and Singapore. The company was formerly known as Genting International PLC and changed its name to Genting Singapore PLC in April 2009. Genting Singapore PLC was founded in 1984 and is headquartered in Singapore. Genting Singapore PLC is a subsidiary of Genting Overseas Holdings Limited. pyramidpoh Compared to GentingM its location is too small for any construction for playground for children and entertainment can't be enlarged just like Genting Malaysia .Tourists like to visit Genting Malaysia rather than GenS because compared to currency GentM is cheaper.Moreover GentingM have more beautiful scene to watch and good place for people to relax. Velson Loh May I know what is the dividend distributed in 2014 & 2015 under GENTING SPS$500M5.125% but it shown in GENTING SINGAPORE PLC. I'm a newbie here seeking for the senior helping hand. I'm holding 3,000 of GENTING SINGAPORE PLC but never received any of the dividend under GENTING SPS$500M5.125%? JQ96 Hi Velson, Genting Sing hardly give out dividend. SyedIbrahim It's high time to collect ! samk its time to collect.keep it for 1 year to reach 1.00..25 percent!!! zaqwerty People keep forgetting Genting is a casino. Nobody win in any casino. NicholasNWH90 Didn't realise Genting comes back so much from 0.66.
davidqsk forming a platform to bounce up soon. prince_mk98 sand sg got listed in sgx or hk? anyone know? samk very positive news.. heng heng !!! LeeJacky genting japan business will contribute to genting singapore? samk as i said before.. buy at 0.75 and keep 1 year... already hit 1.00.. more positive news is coming as chinese tourists and vips flooding singapore.. airlines and genting sp will fully benefit from it... end of this year can easily hit 1.25-1.35... huat ar!!! Monsterlim Genting will go up if it wins the rights to operate the casino in Japan. It is going to be a fierce bidding war. samk Gensp have 5b cash in hands.. they are highly qualify and chances of them winning the bid is very high....genting is not a normal casino...look at genting malaysia .. entertainment , tourism , casinos , resorts...their business concept is the best for Japanese people to boost the economy. ckchung despite good annual profits but the share keep on dropping none stop, why? 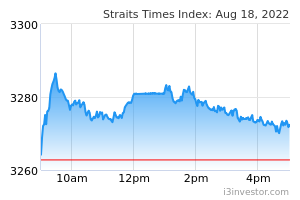 davidsmith These days GENTING SINGAPORE PLC stocks is complete side bias. No volatility in this stock.